Compaq Presario B2800 is a Centrino-based notebook PC with an elegant piano-white finish, equipped with 14.1” XGA BrightView display, and weighing just 1.96kg with thickness of 2.4cm. Other specifications include 512 MB DDR2 SDRAM running at 533 MHz, ATI X600 SE with 128 discrete memory and 128 mega of Hypermemory, integrated WiFi, Bluetooth and DVD-RAM. NotebookReview concluded that “This is not a notebook for everybody, this may sound obvious but this is a notebook for those that are searching for a 14″ stylish notebook that has a dedicated graphics card. If you’re looking for a very good deal, for excellent performance or the lightest notebook this isn’t for you. On the other hand I must say that I’m very satisfied with it because it does all I need it to do and it pleases my eye and it even allows me to carry it with relative ease from one place to another. 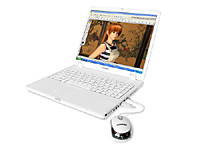 It is good for casual gaming, it is good for word processing, spread sheets and similar and is powerful enough for some web designing.